Performers include: Leslie Nielsen, Alan North, Rex Hamilton, Ed Williams, William Duell, Peter Lupus, and Tessa Richarde. At the start of each episode, a special guest star is announced, and then is promptly killed. 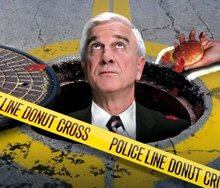 Then, straight-laced Detective Frank Drebin (Leslie Nielson) and Captain Ed Hocken (Alan North) solve a variety of strange criminal cases amidst a constant supply of sight gags and misunderstood dialogue. Police scientist Ted Olson (Ed Williams), Detective Norberg (Peter Lupus), and Johnny the Snitch (William Duell) assist them. A parody of 1960’s and 70’s police dramas, this Zucker, Abrahams and Zucker series was preceded by the Airplane! movies and inspired the Naked Gun films that followed.